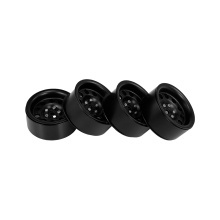 This high quality 65mm wheel rim instantly enhances overall performance in handling and durability, which is specially designed and manufactured for TRX-4 Traxxas Axial SCX10 HSP RGT RR10 RC Rock Crawler Car. It is characteristic of Good balance and heat dissipation, Sturdy and durable. Perfect for your RC Car.